I realized that I’ve been ignoring the upcoming ‘Home Sweet Home’ Quilt Along (starting this TUESDAY 1/17!). I haven’t meant to but as many know – not only was this week the first week of Project Quilting – but it’s also January which means – get your taxes together and pay sales tax. That, along with my new goal to get to the gym at least 4 times a week – I’m in need of a new schedule – yet again! Anyway- back to the excitement! The Home Sweet Home Quilt Along! It’s going to be fantastic! I just finished my block design which will be posted on Tuesday. Diane is going to make it to check my instructions before I post them to you all but hopefully it’s going to work! How much fabric am I going to need? I’m going to be completely up front by saying I’m not 100% sure. I can give you an estimate but your best bet is to make this a scrappy quilt. Find fabrics in the same color family’s – pay attention to the tones. I think if you got a decent stack of dark, medium, and light toned fabric you’ll be sitting good. My mother-in-law, Diane, figures that if you have 5 yards, or 20 fat quarters (the scrappier the better for this one) you should be covered. 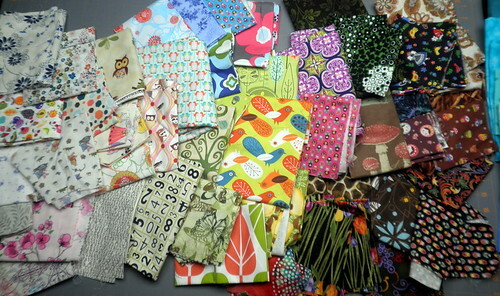 I recently reorganized my fabric stash and as I was doing that I just pulled any fabric that caught my eye. 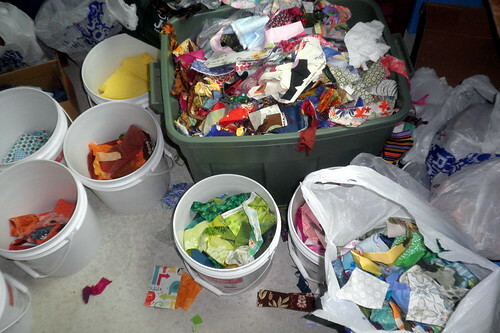 The pile above is what I’m going to start with for my quilt. 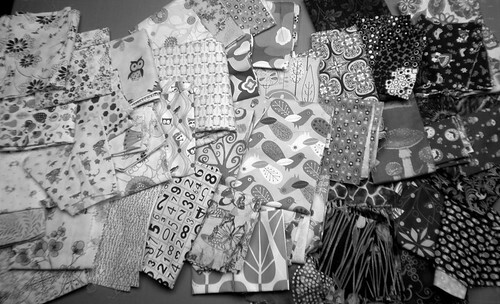 I took that image and made it black and white to check the tones of my fabrics. It looks like I have a decent amount of dark and medium/light but I’ll have to keep looking for those medium/dark and light fabrics. I did include a lot of fabrics that have houses and or trees on them already. I’m really going to milk this theme and make this a full of these fun elements! My quilt is going to be a fairly standard combination of blues, blues, browns, greens and blacks with a few pinks and reds thrown in here and there. I can’t even begin to tell you how excited I am for this quilt! Designing the first block was super fun – and trust me – I'm showing you quite a few techniques to fit into a 12.5” square – but they’re all fun! See you on Tuesday for for the first tutorial! Be sure to become a member of the Flickr Group: http://www.flickr.com/groups/1850682@N20/ so you can easily share with us when you finish your block! PS. Project QUILTING pieces are due at NOON tomorrow! Hope you get your piece done but if you are just watching along pieces are going up regular to the flickr group! So exciting!